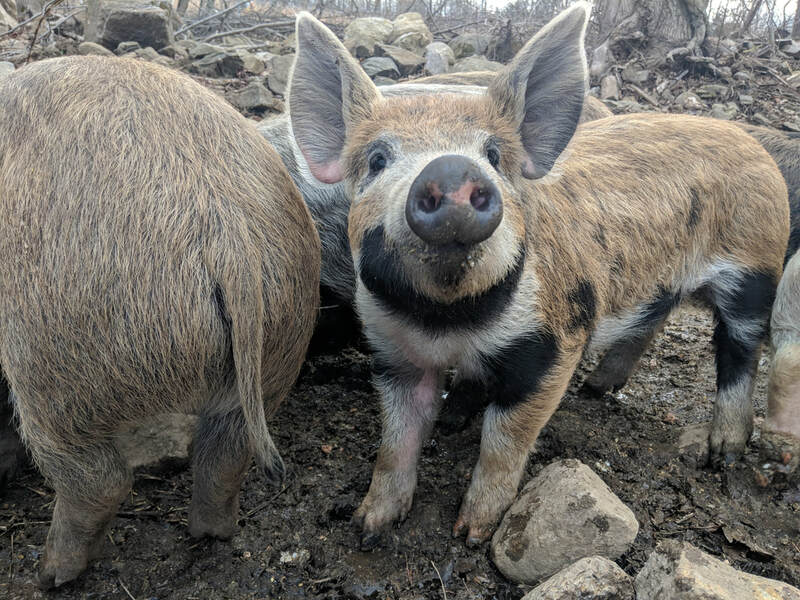 Like the rest of our livestock here at BOTL Farm, our pigs are heritage breed (Mangalitsa / Berkshire), raised on pasture and in forest (eat the forest, pigs! ), and supplemented with corn-free, soy-free, non-GMO feed. We are currently accepting deposits for wholes and halves. In addition, we will have cuts available in late April for those of you who are interested in, say, single pork chops or just want to sample what one pound of corn-free/soy-free fed bacon tastes like. More details available on our blog. 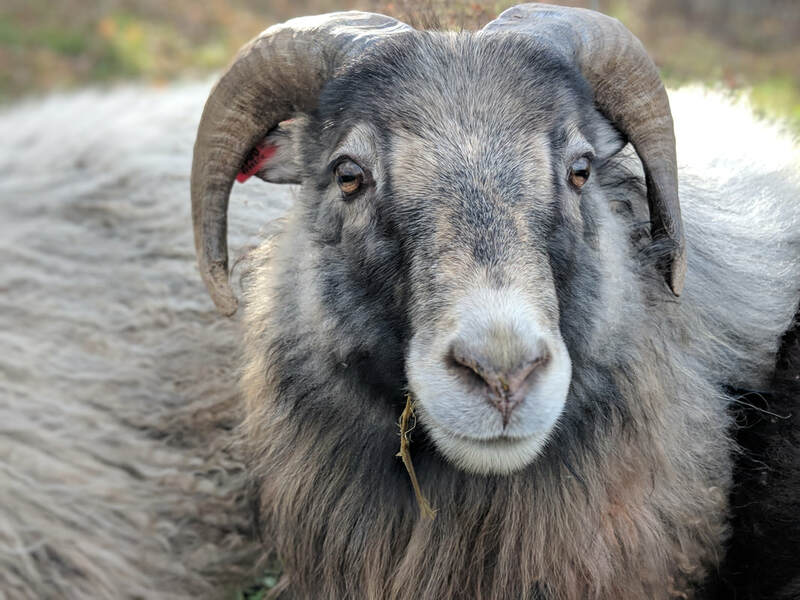 BOTL Farm is raising a small herd of Icelandic sheep. This shaggy and majestic heritage breed has pronounced horns and is very comfortable during our cold New England winters. Every spring the ewes give birth and raise their lambs on pasture. They are all-grass fed, never supplemented with grain or other feed. Every fall, lambs will be available (late November to December) and are sold as a whole animal. Take-home is 40 to 45 lbs meat. 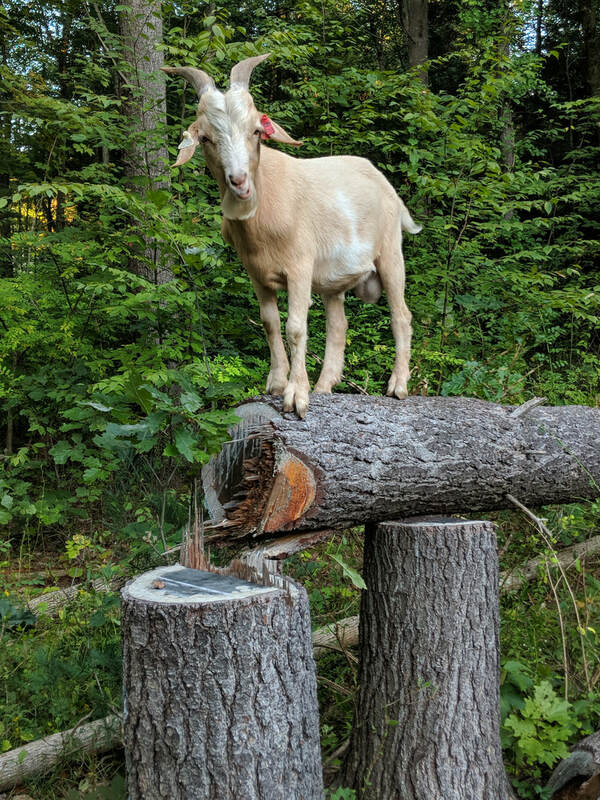 Lots of farmers think that raising goats is a terrible idea, and here at BOTL Farm we were interested to find out exactly why that is. Turns out, goats are the noisiest, nosiest, most curious creatures we have... but they love to eat poison ivy and the bushy, thorny things in the forest that the sheep and rabbits avoid. Their dedication to hard forage makes our passive, animal-driven forest clearing possible! So, against the advice of generations of farmers before us, we're making more goats! We have a breeding pair of purebred Kiko goats. Originally from New Zealand, this breed is basically the super-heroes of goats: famous for hardiness, low susceptibility to worms and disease, ability to birth and successfully raise triplets, and the males have truly epic horns (up to 4'!). Similar to sheep, the goats will give birth in the spring. We'll welcome the female kids into permanent forest-clearing positions and will sell the boy goats for meat in the fall as wholes. Our goats are also grass-only fed, except they get apple treats when they've been good. 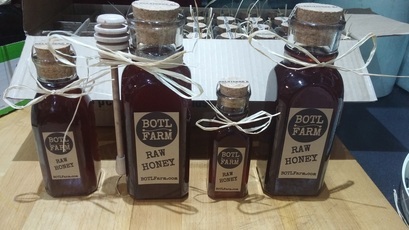 Our honey is as natural as can be and is a mix of the entire season's harvest (often considered wildflower honey). The honey is sold in a variety of recycled glass jars which are capped with quickly-renewable cork closures or metal screw-top lids. All labels are 100% post-consumer recycled paper and not dyed. It doesn't get much more hippy than that. We have an empty jar return program to help keep the glass out of the landfill. Bring back your empty glass and we will give you cash. Honey is seasonally available and it will be posted on Facebook, our blog, and the farmstand sign each fall when there is some for sale. Our rabbits are 100% pasture raised. They are on a rotational grazing system that gets them to new pasture every few days. 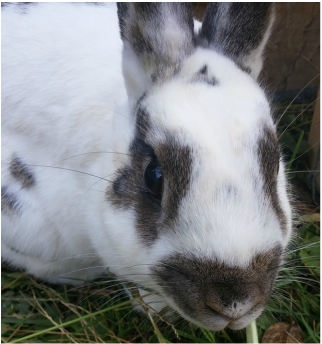 Our system allows the rabbits to freely choose what they eat and when they eat it. They are allowed 24/7 access to the mix of grasses, legumes, weeds, herbs, flowers, and plants that are in their pasture. They are supplemented with an open feeding of GMO-free, corn-free, soy-free mixed grains, cereals, seeds, and legumes if they prefer. Further, they always have fresh alfalfa/timothy hay at their disposal. Their mobile hutch provides them shelter, but they honestly prefer to hide and shelter in the tall grasses that encompass the pasture. Rabbits for sale weigh between 1 and 3 lbs, costing $10/lb. Please contact us for pre-orders. Our rabbits are lean, mean, meat-makin' machines because they run around free range so much (and in general, they're really very nice [except for the male breeder]). Their average muscle content is at least 19.2185% higher than their equivalent caged rabbit partners. I made up that statistic, but they're definitely living happier, healthier lives (secondary farmer notes it's difficult to quantify a rabbit's happiness). P.S. - rabbit ears are available upon request. We recommend making rabbit ear chips. The beeswax used for these candles is a byproduct of our honey. There are no additives in these candles - just our wax and the wicks. The wicks are 100% cotton with a metal safety tab. The candles are approximately 2 inches tall and 1.75 inches wide. During testing they burned eight to ten hours. 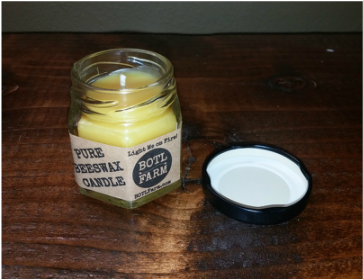 Because there is limited wax during processing we only have a small supply of candles. We expected them to sell out quickly, but they didn't. Actually, nobody but my mom has bought any. Thanks, Mom.! Update: people besides my mom has bought and enjoyed these candles! They're now available in the honor box. 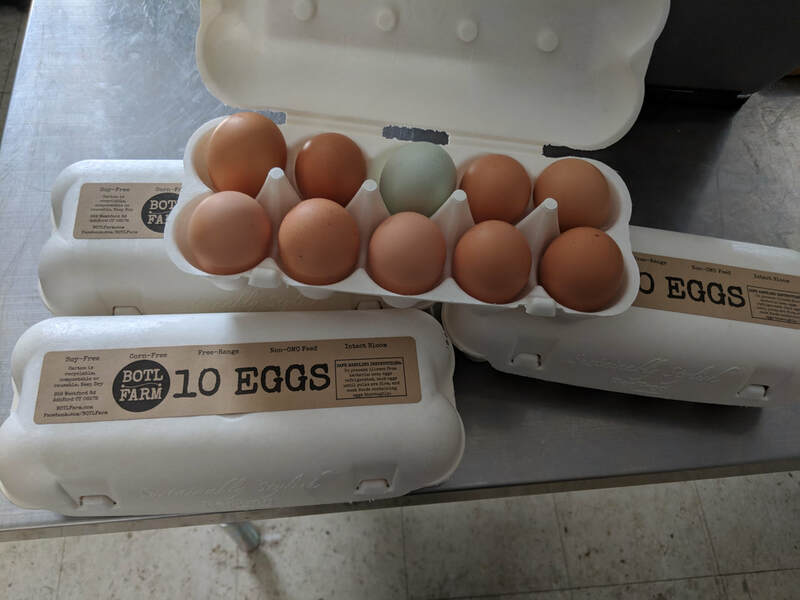 Our flock of laying hens is primarily Rhode Island Reds, with a few Easter Eggers, Barred Rocks, and New Hampshires for variety. They live on pasture and like all our other animals are rotationally grazed. Their nesting boxes, roosts, and supplemental feed (not to mention weather protection) are in a sweet-looking 1980's mobile home that we drag around with our tractor to take the chickens to new areas. Much like the rabbits they are free to go in and out of their mobile home as they please and they spend most of their time doing what we affectionately call "chicken stuff," which means walking in circles, scratching, and pecking at the ground looking for tasty bugs and things. 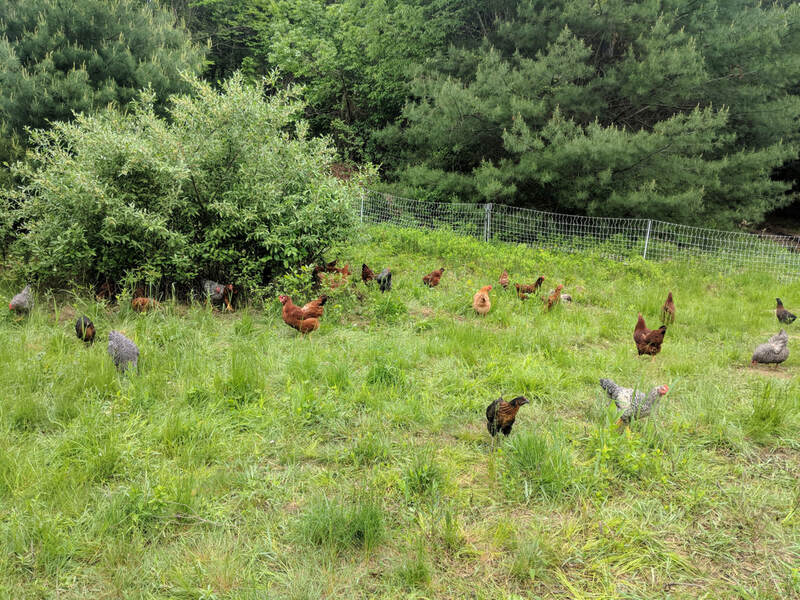 The chickens are supplemented with corn-free, soy-free, non-GMO feed and plenty of granite grit (they like that sort of thing). Because we breed our own chickens, half the chicks that hatch are boys. They are raised with the hens until they reach salable weight and then we transfer them to our freezer. This means that whole, frozen, ready-to-cook chickens are available! 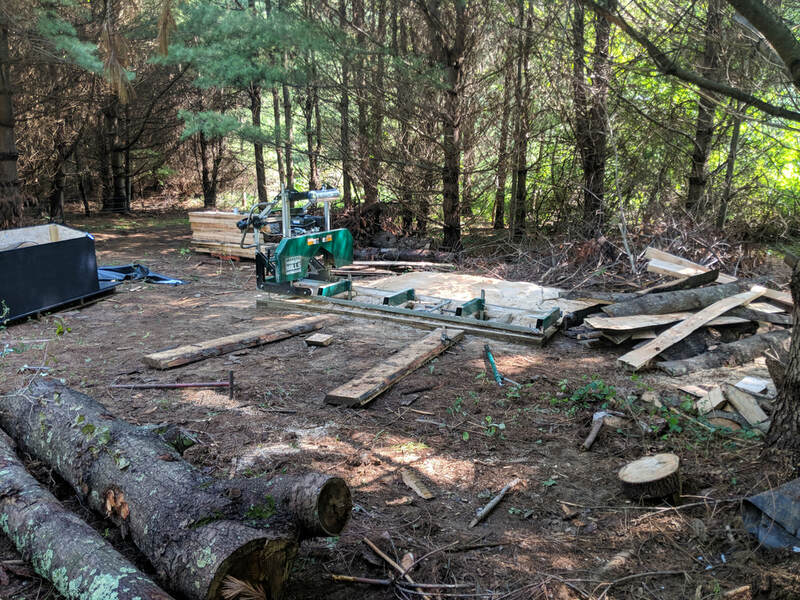 With our sawmill and nearly infinite supply of trees we are making rough cut lumber. Most of what we're sawing is pine and oak. We specialize in pine 1" thick boards which aren't usually available at big-box stores. There are many widths available, including 6" and 8". Boards are between 5' and 10' long. We have some oak dimensional and oak slabs, including a few live edge boards/slabs (those are totally cool right now). Come on over and see what we have cut, check out our Craigslist posts, or send us a message with a specific order you're looking for and we'll custom cut it! 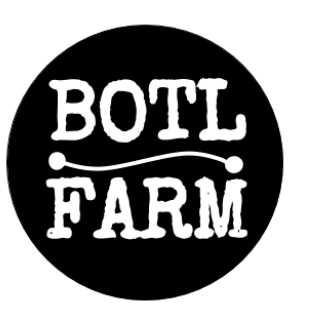 Here at BOTL Farm, we've been making our own soap for many years. We finally made enough that now we're going to share it with the world at large! The soap is made by hand in a relatively small batch from lard, tallow, and coconut oil. We rendered the lard and tallow from thoughtfully-raised animals we know. Honestly, we bought the coconut oil on Amazon, but it adds a delightful foaminess to the bars. They're finished with a hint of tea tree and lemon essential oils to keep them (and you) smelling pretty and fresh.